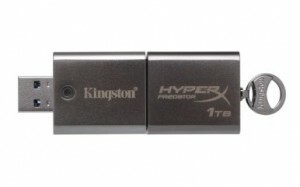 The Kingston 1TB Flash drive is a very portable device that stores up to 1TB of data. It has USB 3.0 which offers transfer speeds of up to 240MB per second when reading data, and up to 160MB per second when writing. The cost was expected to be 2 – 3 thousand dollars but now this device is out the price seems to be half that. Why would you spend so much on this device? You know when you are transferring files to or from your flash drive and it seems to take for ever. Well this device will cut time drastically with its usb3.0 capabilities. I’m sure for the Business savvy person who is time poor will embrace this device as a great time saving device with the power of 1TB of data in such a convenient package.